Here’s a fun Halloween game (or anytime game for that matter!) 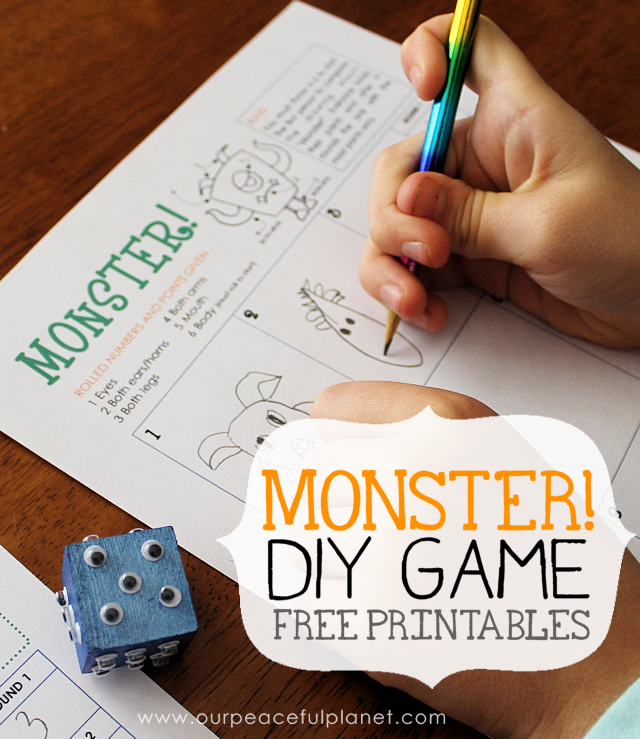 Kids and adults alike will enjoy “Monster!” Just grab our free downloadable printables which includes the instructions and make a monster dice using a wood block and some wiggle eyes. It can be played with two or more or in groups and has various scoring options. Let players copy the monster example or use their creativity to create their own. Adorable odea, but I’m confused! Are you supposed to draw a new monster each round? Are you supposed to add just the part that corresponds to the number rolled? Or all parts every time? The example pic looks like the 2 kids drew whole monsters every round and just used the numbers for strictly scoring. Yes, each round is a new monster though you can draw whatever “type” of monster your wish. Or keep the same style each time. For each round, when someone rolls a number they add the part that corresponds to that number. They keep doing that for that round until someone gets their own monster completed. Then everyone moves to the next round. Is that any clearer? too cute! What a fun game. I love the dice! What a cute idea! Thanks for sharing! Next: It's Easy to Make Cinnamon Oil!